This time of year I often get asked about wines for a company party, for a unique gift to take home for the holidays, or a Moscow New Year’s present for the boss. Here is my comprehensive 2011 Moscow Holiday Wine Shopper Guide. Chateau Le Grand Vostock, with its French winemaker, and new French equipped, top-of-the-line winery, is clearly, by an order of magnitude, Russia’s leader in terms of modern wine production. CGV has pairs of red and white wines at several price levels starting with Terre du Sud at 199r per bottle to Cuvee Karsov at 430r. They have an English language website, stock in Moscow and deliver in case lots. Two other Russian wineries, Fanagoria and Mysakho, employ an Australian flying winemaker, John Worontschak, and some wines from either winery might make a good selection. Fanagoria has two lines, Cru Lermont and the lower priced NR, which I’ve seen at Auchan and Sedmoi Kontinent. Also, keep in mind that many Russians, though some would be loathe to admit, really prefer sweet wines. Fanagoria makes a very rich, dark sweet herbal wine that is very reasonably priced wine called Chorny Lecker, which you might add to the menu. Tsimlanskoye Sparking (500r), with the bottle encased in a fancy tin. Novy Svet Pinot Noir Brut (600r), a very dry rose sparkling wine that bested some French Champagnes in a Passport blind tasting in 2008. Serve very cold. Abrau Durso Classic Brut (600r), from this historic winery on the Black Sea. One of the best sparkling wines I’ve ever tasted was at Abrau Durso. Keep in mind that these wineries also produce cheaper sparkling wines, which are produced using the faster Soviet “reservoir” method and at least from local grapes, unlike the sparkling wines produced at so-called “wineries” in the big cities that are far from grape sources. 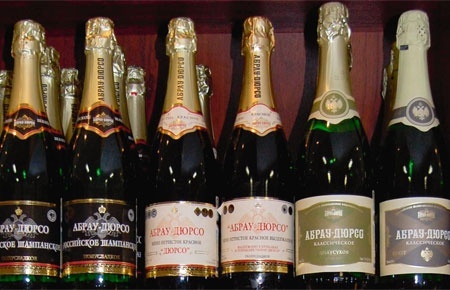 The Massandra shops in Moscow carry many Russian and Ukrainian wines including the sparkling wines from Abrau Durso, Novy Svet and Tsimlanskoye. If you insist on import wines, Argentinean and Chilean wines offer a good value price ratio, with Argentinean a little less expensive than wines than its neighbor. For Bordeaux, the best value I’ve found is a pair of white and red from Bel Air Perponcher (Bordeaux Superieur AOC) available from Kauffman shops. The South African Tortoise Hill Red and White are a good choice under 600r from Grand Cru. For Italian, try a pair of Villa Antinori from Intendant. It’s always nice to take home something of quality that’s actually made in Russia, something besides a matryoshka doll set. The aforementioned Russian wines might do, but an interesting choice would be the wines and spirits from Praskoveya Winery near Budyonnovsk of Stavropol region. 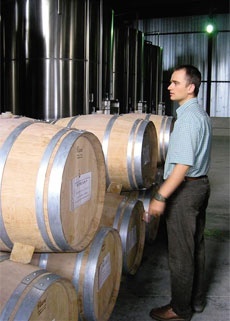 Praskoveya specializes in brandies (called cognac in Russia), produced under a French-trained winemaker. Praskoveya also makes a retro-labeled Samogon No.5 (Russian moonshine), which is grape based and 45% alcohol. 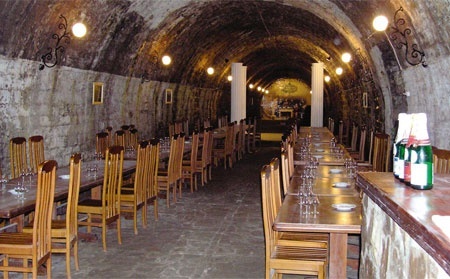 It also has a large collection of wines dating back to 1945, post German occupation. These Praskoveya collector wines, such as a 1992 Uliybka (Smile, a sweet Muscat wine) at 1,460r or a 1955 Buket Prikumya at 17,660r, and its brandies and samogan are available at a small shop off Krasnoprenya Prospekt near the Moscow zoo. The membership shopping retailer Metro has the best prices in town and a very broad selection; the only catch is that a membership card is required to shop at Metro. The wine choice at Auchan is disappointing; it is poor and thin, and mostly very low end. Among city supermarkets, Azbuka Vkusa remains the best for choices but it has few wines under 800 rubles. The selection at Sedmoi Kontinent and the AM alcohol shops is better in the lower range. Head out of town on Kutuzovsky, and start at Kollektsiya Vin (under common ownership with Azbuka Vkusa) at Kutuzovsky Prospekt 18. Leave your car because you can walk to the next three; in short order Grand Cru (Simple Wines) and Kauffman (VX Import) at Kutuzovsky Prospekt 22, and Magnum (DP Trade) at Kutuzovsky Prospekt 24. Return to the car and go a little further out Kutuzovsky and swing around back towards the city to stop at Intendant (MBG Group) at Kutuzovsky Prospekt 33. Kollektsiya Vin – a good selection, few wines under 800r, and many wines come from other importers, so prices may be higher than their neighbors a few steps away. Grand Cru – I like Simple Wines selection, but there are very few wines under 800r. Grand Cru has a good website and online order system that shows Parker and Wine Spectator ratings. Kauffman – has the best line of wines priced under 800r and an excellent selection of New Zealand wines. Kauffman imports the huge Concha y Toro line of wines from Chile and Robert Mondavi California wines, but it has Seghesio Zinfandels, some of the best American reds in Moscow. Magnum – carries the outstanding Australian wines that DP Trade imports on behalf of wine expert and PGA pro Grant Dodd, a Friend of Passport. Look for Grant’s wines from Dalwhinnie, Dutschke, Kaesler, Kalleske and Wild Duck Creek. DP also imports Montes wines from Chile, which are consistently good. It also imports the very expensive, California cult wines from Sine Qua Non, the ultimate gift. Intendant – exclusive importer for Antinori, which produces the very popular Umbrian Cervaro della Sala, a Chardonnay, and the beautiful and respected super Tuscan Tignanello. Intendant also imports from several good California wineries. By the way, Preston Haskell has some of his excellent Haskell Vineyards wines (Stellenbosch, South Africa) in town. Contact me by email if you would like to find them.